Here we will embrace the Halloween, the biggest holiday before snowy Christmas in 2015. With the shops and stores full of children and fun, tourists from other places looking forward to big Halloween parades and activities among big cities like London and Big Apple, peoples who preparing their scream and hormone be released in the cinema. Some people starts to planning special gifts for someone they care about. We all love gifts, whether it’s touchable or not. How about useful and free Halloween gifts for your family? Now, in order to rise the festival atmosphere to another new height, this year, WonderFox Soft have prepared some special 2015 Halloween free gifts just for your kinds of needs in the holidays ! Thank all customers for support and great kindness in many years. WonderFox Soft hereby launches the 2015 Halloween Giveaway between Oct.23 to Nov. 08. 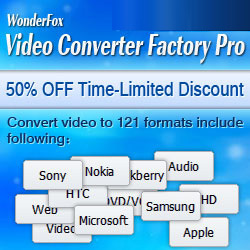 These gifts provided in the Halloween Giveaway by WonderFox not only can help you to enjoy happy family videos shoot by DV during holidays anytime anywhere, but also enable you to download and convert funny videos from YouTube and other social sharing website to formats supported by your smart phone without any quality loss, like Apple series, Samsung and other Android phones etc. Furthermore, the 2015 Halloween gift take movie lovers into account as well, we have a magic gift which can transfer your favorite Halloween movie DVD to phones, portable tablets and TVs with suitable resolution, perfect for those collection fans and travel lovers. Check Out The WonderFox 2015 Halloween Free Gifts Here! WonderFox Software have provides free flexible portfolio of products for best experience based on different requirements. If you like to share good stuffs or want to bring some free and very useful gift with others, or if you have any interest on WonderFox Halloween giveaway gifts or any question about our Halloween Giveaway activities, please feel free to contact zoe@videoconverterfactory.com. WonderFox 2015 free Halloween gift and promotion is valid before Nov 8. Time is limited. Hurry up! Note: No free upgrade & technical support for giveaway version.